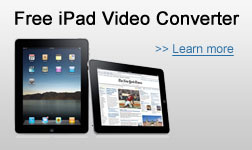 Aleesoft Free iPad Video Converter is a wonderful simple and easy iPad video converter. It can convert almost all video formats to iPad which lets you enjoy watching any video on your iPad anywhere and anytime. Aleesoft Easy Blu-ray Creator is an easy-to-use Blu-ray video creator, which helps you convert, author and burn various videos to Blu-ray video discs and AVCHD DVDs, and even create BDMV ISO and AVCHD ISO from your videos. Burn various videos to Blu-ray discs (BD-R, BD-RE, BD-25, BD-50) and AVCHD DVDs (DVD-5, DVD-9, DVD-R, DVD+R, DVD-RW, DVD+RW, DVD+R DL, DVD-R DL), Full HD 1080p supported. meanwhile, you can burn video to DVD, SVCD, VCD. Rip and Convert Blu-ray (m2ts) videos to other video and audio formats such as AVI, MPEG, MP4, WMV, FLV, MKV, MOV, 3GP, SWF, ASF, MP3, WMA, WAV, RA, OGG, etc. Aleesoft Free MKV Converter is a freeware can convert MKV video files to formats for portable device including iPad, iPod, iPod touch, iPod video nano, iPhone, Apple TV, Zune, XBOX 360, PSP, PS3, Nokia, BlackBerry, Sony moblie phone, etc. Meanwhile, it can also support output almost any audio or video formats like MP4, WMV, AVI, DivX, 3GP, FLV, SWF, ASF, MP3, WMA, WAV, etc. Convert mkv to popular video formats to transfer to iPad, iPhone, iPod, Apple TV, PSP, PS3, Blackberry, 3GP, Flash Video, Zune, XBox 360, WII, Nokia, PowerPoint, Sony phone etc. Aleesoft Android Converter is a android video converter that can help you convert videos, DVDs, Blu-ray discs, HD videos, youtube videos, hulu videos, movies to your android device, it's not only including Google, but Motorola, HTC, Samsung, Song Erisson and some other main manufacturers have been keen on Android moblie phone, smart phone or any other device based on Google's Android operating system. Convert all types of video file such as AVI, MPEG, TS, OGM, MKV, WMV, MOD, MOV, MP4, 3GP, MPG, ASF, FlV, VOB to android. Convert all types of audio file including MP3, WMA, WAV, MP2, AAC, AC3, AU, OGG, FLAC to android. Aleesoft Studio released Free iPad Video Converter V2.5. Aleesoft Studio released MKV Video Converter V2.5. Aleesoft Studio released Blu-ray Creator V2.5. Aleesoft Studio released Blu-ray Ripper V2.5. Aleesoft Studio released Android Converter V2.5. Aleesoft Studio offers holiday gifts, all products save 33%. Aleesoft Studio released Free iPad Video Converter V2.4. Aleesoft Studio released MKV Video Converter V2.4. Aleesoft Studio released Blu-ray Creator V2.4. Aleesoft Studio released Blu-ray Ripper V2.4. Aleesoft Studio released Android Converter V2.4. Aleesoft Studio released Free iPad Video Converter V2.3. Added Video to iPhone 4, video to iPod Touch 4, video to Apple TV HD. Aleesoft Studio released MKV Video Converter V2.3. Added Video to iPhone 4, video to iPod Touch 4, video to Apple TV HD and bug fixes. Aleesoft Studio released Blu-ray Creator V2.3. bug fixes. Aleesoft Studio released Blu-ray Ripper V2.3. Added Video to iPhone 4, video to iPod Touch 4, video to Apple TV HD and bug fixes. Aleesoft Studio released Android Converter V2.3. bug fixes. Aleesoft Studio released Free iPad Video Converter V2.1. Added Video to iPhone, video to iPod, video to Apple TV function. Aleesoft Studio released Blu-ray Creator V2.1.